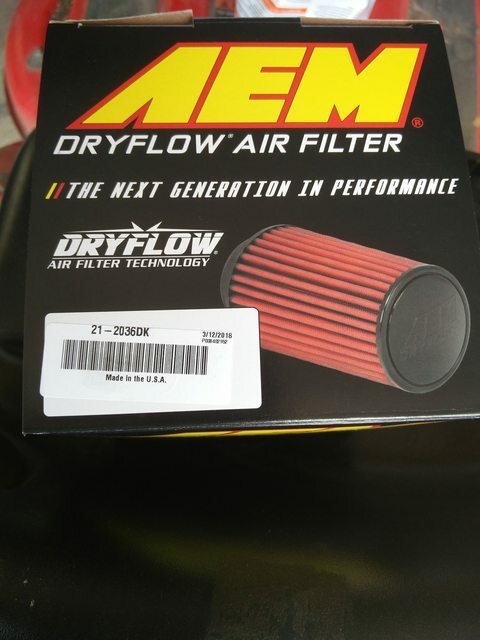 I have an AEM Dryflow filter on mine. Works nice. I doubt if which air filter we have make much of a difference for power. But I see from you two it seems like a dry filter is preferable over an oiled filter. I will probably need to make it through Christmas before I can sink more dollars into my Volvo, but a filter and 012 amm are definitely next on the list. It really doesn't make a huge difference, performance-wise, but the extra noise is nice. As for filters, I've seen the oiled ones gunk up AMMs and throttle bodies, FYI. Nooo, don't install an oiled filter! They're horrible for anything that's not maintained after a few hours of use such as race cars and ATVs. That oil coats the inside of everything like Kardboard said, still lets dirt through and just makes a horrible mess. Keep to the paper! There are enough MANN filters and stock replacements that have the cone form for noise, but retain quality filter properties. Get a paper cone filter and cobble together an adapter, your daily driver will thank you! Nooo, don't install an oiled filter! No name unbranded CHINA filter, better than K&N properly oiled (per their specs)? Please tell us why! Got studies, flow rate at specific pressure drop, dirt passed into engine, anything? There don't seem to be a lot of haters of the "Ken & Norm" air filters, not that I'm finding online. Perhaps Deutschland is holding the secrets...... please share. Those links just underline my own personal experience with K&N filters. 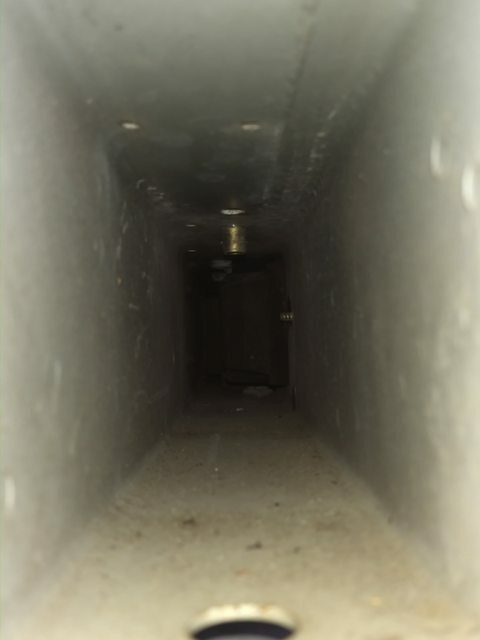 Get a paper filter, replace it every 15,000 miles and enjoy peace of mind and a dry/clean intake tract. 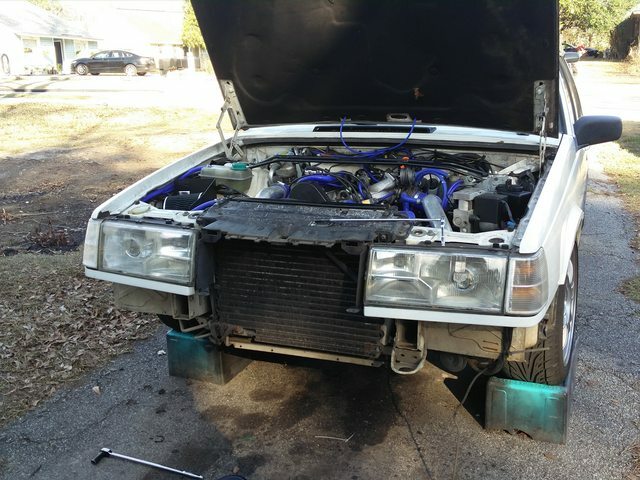 If this thread was titled "Turbobricks MAXhp Bling Build" then nobody would care what kind of filter was installed, cause the car'd be crushed before the next oil change. But for a "*longterm* daily driver" I'd go with the best air quality rather than... bling. But for a "*longterm* daily driver" I'd go with the best air quality rather than... bling. The title of this thread was true for a time after I started this thread, but at this point it's a once/twice per week fun driver. I like driving it to work and would everyday, but I have a nagging sporadic high idle I need to just address. Usually Saturdays it goes to work since there's no traffic. 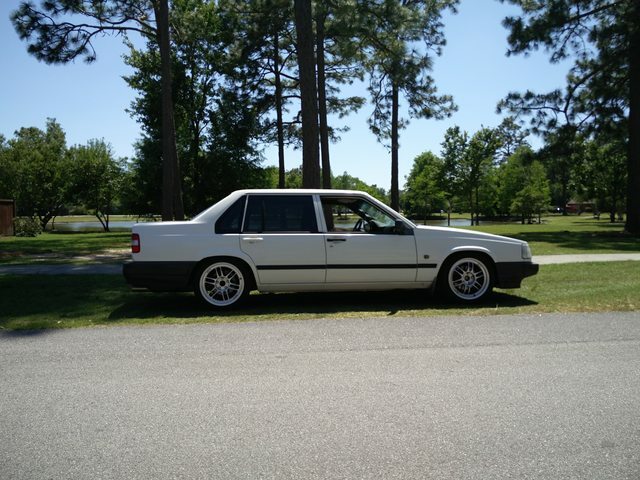 But I am devoted to this car. Its not going anywhere. I read the majority of every link you posted. I was uninformed, that's for sure. I don't drive in poor conditions typically and the filter will be (mostly) enclosed in the heat shield. So, I think I'm going to go for something like the AEM dry filter +Kardboard+ showed. The dimensions should fit nice and no oil is clearly the way to go. My car has been on the back burner for the last few months due to doing an engine swap on my brother's wagon in my driveway. But that is finally complete and working well for the most part. Now I've got my workspace back. I was bored so I rolled my car up on ramps. 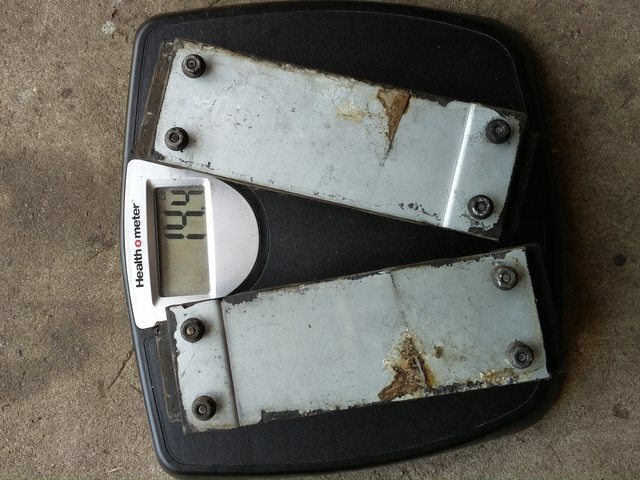 I'd always read about people removing frame rail weights on 7/9 cars and decided I had nothing better to do. A lot of folks probably think doing this is a waste of time and maybe so, but losing a couple pounds off the front end couldn't hurt the cars performance. I read a little about doing this but all the links and pictures were mostly dead. All you have to remove to do this is the front bumper and bumper shocks. 4 bolts and 4 nuts total. This is what you're greeted with after removing the bumper. This is the only glimpse I could get of these parasites. They're way in there. I took off more bolts than I needed to that I thought were holding it on. But it is only four 10 mm nuts (all four on the side of the frame rail). I also loosened the sway bar mount. Not sure if it was necessary but it seemed to help. Then with the help of a wire hanger, I pulled these little buggers out. Roughly an hour and a half worth of effort yielded this loss. Last edited by soclosenotnear; 02-15-2018 at 07:49 PM.. Interesting! Guess I've been in a vacuum... never heard of these "structural dampers". Those Engineers had their reasons I'm sure, for strategically locating these masses of iron. I just so happen to still have my front bumper off....... hmmmm. Something about noise vibration frequencies. I can't tell a difference so far. Fwiw, they apparently weren't installed in 760/6 cylinder cars due to their additional weight. Exactly. The ways to shift the frequency away from annoying "cruise levels" is to (1) change the stiffness and/or (2) change the mass. My idea for using 240 plug wires with my wasted spark setup did not work. The Bosch 2x2 coil pack works better with 7/9 series plug wires. Mine had fallen apart so I needed new ones. The suggestion was kingsborne so that's what I went with in 8mm. Here's the thread for reference. 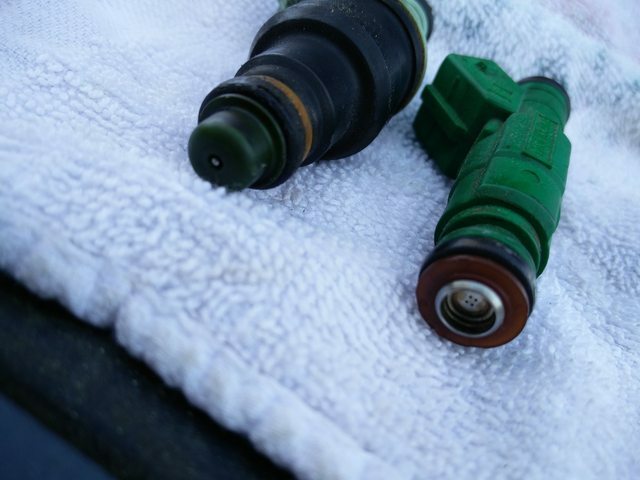 I also bought an 012 amm to pair with my s60r "green giant" injectors. Am I right in thinking my current chips will be alright after a reset with swapping amm, injectors and raising the boost. I have a wideband to monitor, but just trying to confirm that I wouldn't need remapped chips or something else I overlooked. I realize this is all a bit much for a 16t, even at higher boost, but I've read others have had success with the same formula. Any tips? I'll be running your very setup (AMM and injectors) with TLAO fuel and ignition chips. I can't say what they will do with your stock fuel & spark chips/ECUs. Simon Babbs would be a good resource.... he's BTDT. What I can say, is the 012 AMM has the same exact "instrument" for air flow as the 016 (your stock unit). However, the larger body of the 012 slows the air flow down.... which will lean out your large injectors. This will fool LH2.4 and get the fueling tables close with larger injectors. I've read threads dating since 2005 of folks that claimed they ran essentially what you and I have, with good results. 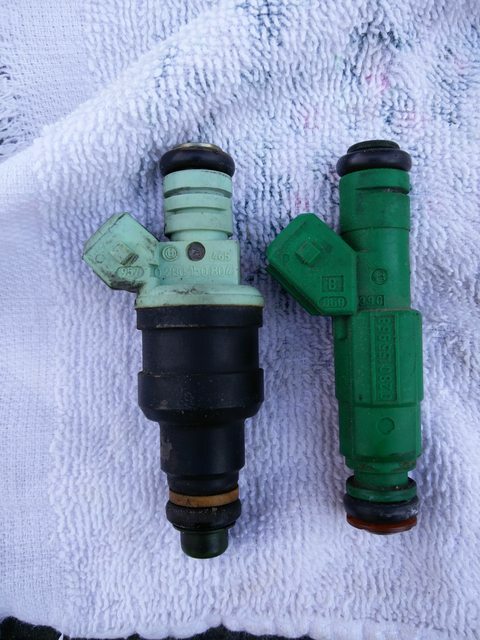 If these records can be trusted, injectors from 42~46 lbs/hour will work with the 012. The question you will get is "how much power are you going to make?" If you have a fairly stock engine, you won't need the air/fuel mass flow rates those injectors can provide. For a check, find one of the injector size calculators, plug in 250HP and see what it tells you. I think it will probably show you around 40#..... but remember, that is at full boost with WOT and you are trying to make max. power out of the 4 banger. The bigger question is how will overall drivability be? At low speeds, high vacuum, will LH2.4 be able to lean out those injectors? You won't know until you drive it. If the 968 injectors are too much, get the 850 "blue tops" which I think are around 36#/hour..... Philski has a set for sale right now. Don't worry! If those 42# are too large, flip them and run what works. Last edited by DET17; 03-15-2018 at 09:06 PM.. Thanks for the advice. That was my general understanding and I am running some sort of aftermarket chips (Fred's or other, not sure). So, hopefully everything jives together well. Like you, I've read countless threads with similar setups so I am optimistic about things working out. I got my injectors installed yesterday along with bypassing the resistor. I'm waiting on some new plug wires to come in the mail, then I'll be able to see how the car acts. I'm not opposed to finding a different chip set either if need be. I've just not read of anyone having to retune for bigger injectors/amm. A local friend, however, claims he had issues getting his 012 amm to work with his TLAO chips. Obviously, there are many variables at play, so I'll plug it all together and see what happens. I have a wide band to monitor things regardless. .......Obviously, there are many variables at play, so I'll plug it all together and see what happens. I have a wide band to monitor things regardless. The best insurance policy there is... just short of data logging AFRs. It misfires/stumbles under nearly any amount of load. Also, it's not always either. Sometimes I can drive several miles without a stumble. It seems exactly what others were experiencing in that thread. I'm hunting down another EZK box locally, but trying to understand what my issue is a little more if anyone has any advice. Did you already swap the input wires to your power stage? It is well known that many of the Buchka boards were reversed by their supplier (both mine and my son's for certain). Next suspect for me would be EZK damage after the soldering work; first gold box my son soldered for me wouldn't run after the conversion. Mine will be coming out soon as I move the WS to my gold box with TLAO ignition chip. Which leads me to my next idea. 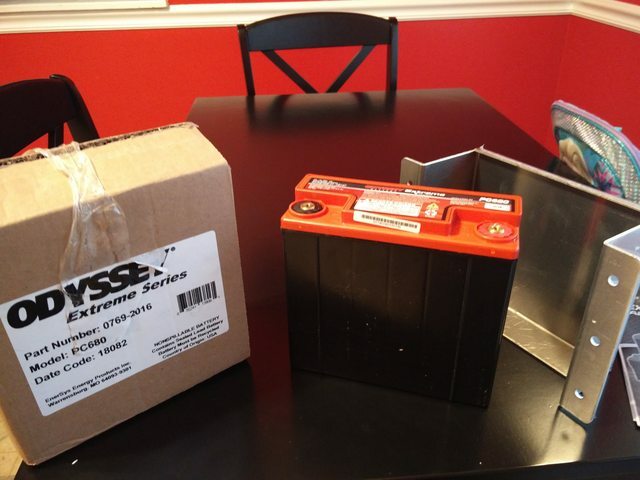 I think I want to mount a (smaller/lighter) Odyssey pc680 battery in the trunk. I've been constantly straying further away from this being a "daily driver" like it was intended to be. On that same topic, I have a roll cage I bought years ago sitting in the garage, just itching for a home. It would look cool in my lawn ornament also. I'm not set on these ideas, but I don't have much for dollars at this point in time, and yet I still want to make my car faster. Weight reduction, right? Talk me out of these stupid hair brained ideas. Welp, I just ordered a roll of 0 gauge power wire, a 250 amp fuse and a distribution block, so the battery is officially going in the trunk at this point. I'm excited to clear the room in the engine bay if nothing else. A year or more ago, I replaced my door handles with 960/s90/v90 door handles. I, apparently, installed the rear handles incorrectly and have had troubles ever since. Now, I cannot get the rear driver's side door open with the inside or outside door handle. I was able to get the door panel off fairly easily and I thought it would be cake to get the door open afterwards. Wrong! It seems that both the inside and outside door handles are moving their full range of motion, but no dice. I need to get this door open in general, but especially now that I'm trying to run my battery power wire down that side of the car. Any suggestions? Last edited by soclosenotnear; 04-15-2018 at 10:43 AM..
Lots has happened in the last month or more with the car. I won't cover it all as I'm still working on certain things. 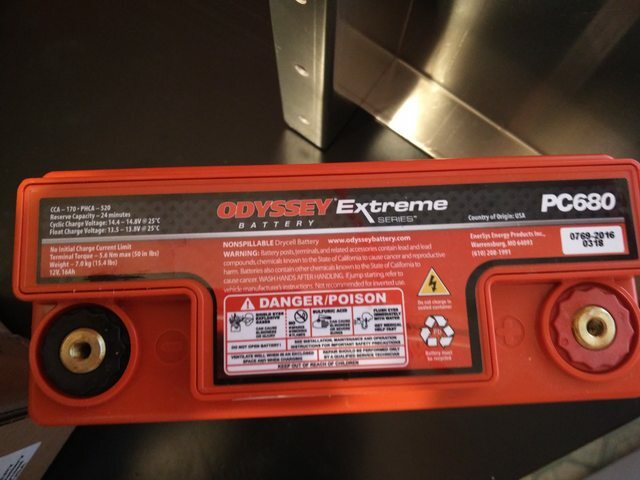 But my odyssey pc680 battery now resides in the trunk. Because I had to pull a portion or the interior out to run the battery cable, I was able to get the door panel off and get my driver's side rear door open for the first time in 18 months. That was an amazing feeling. I still need to fidgit with the door handle but it opens and closes ok now. Car was running pretty well aside from my normal sporadic high idle I've been dealing with since I bought the car. The 3" amm and Bosch green Giants seemed to be doing ok at 20psi on the 16t. Afr were good driving, at idle and in boost. It was running so well that I drove it every day for two weeks, even with the interior half apart. Going back to my 2012 civic si was so gutless in comparison. But whenever, my high idle would happen, the car would go very rich, throttle response was non-existent and drivability wasn't good at low rpm. 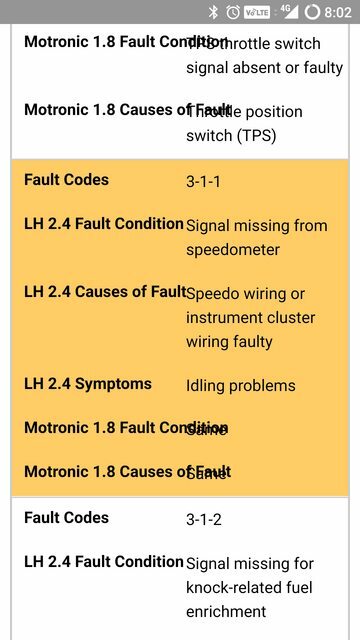 I finally pulled the codes despite no check engine light and was given a 3-1-1 which apparently means lh2.4 is missing the speed signal. My speedometer seems to work fine so I think I need to check back of cluster to the computer and in between. But hopefully I'm on the right track to finally solving a long high idle battle. Any other suggestions for a 3-1-1? I think I may pull up all the sound deadening from the floor of the car and trunk. A heat gun and paint scraper seems to pull it up cleanly enough. After that I'll lay a simplified and lightened interior back together. At least, that's the tentative plan. It would be nice to look and function like stock and lose a few pounds. Here's a couple pictures of some random progress. Will post more when I make it to some finishing points. 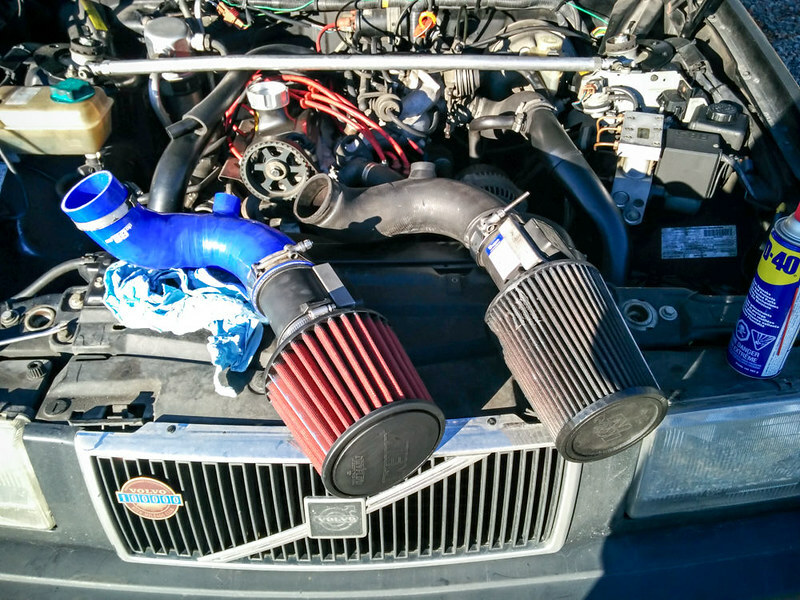 I needed a new air filter to fit well with my do88 3" inlet hose and 012 amm. Here's the part number I went with, a dry intake that will fit inside my air box. I have yet to cut my air box out to 3" yet since I'm trying to nail down these drivability issues with this setup. Here's after it's first wash in 6+ months; a trip to the duck pond with the family. Also, pm me if you have one single smooth white handle for me. 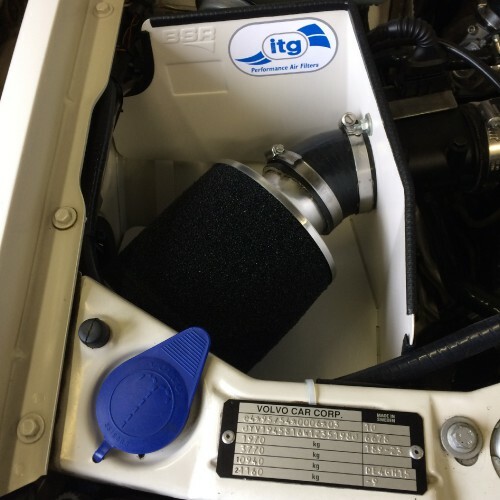 How are you planning on modifying the air box? 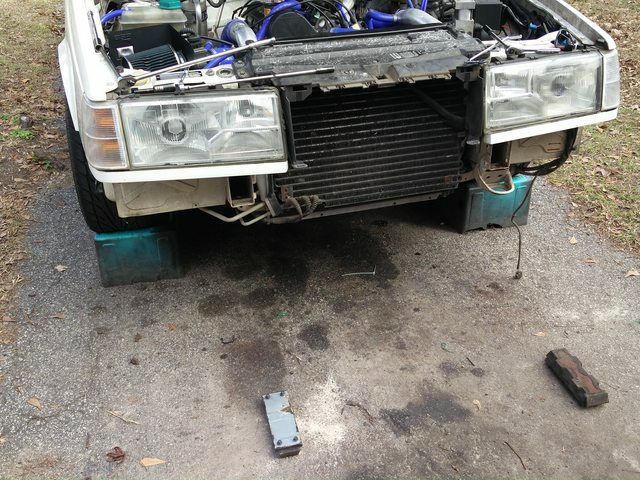 Are you referring to the stock air box or the heat shield you have now? I'm talking about the bsr heat shield. I just need to open up the hole for the amm to 3" and maybe relocate it slightly.